International Gifted Programs are for grades 6-8 (apply in 5th grade.) The program includes intensive study of English, French, social studies, laboratory science, mathematics, technology, arts, physical education, library science, and advanced research. The International Gifted Program is designed to allow intellectually able students to be schooled in their least restrictive environment and to mature at an accelerated pace. Entry filed under: Academic Centers. Tags: cps academic center, lane tech academic center, whitney young academic center. Will Harlan accept students in Fall 2015 since the AC will close soon? The new AC will open in 2016 at Brooks. I wonder how that will all work. Another question….is the poster around who is the Lindblom advocate? I think Pantherettie is his/her name. What is Lindblom like without the great Alan Mather?–in case parents are considering Lindblom. 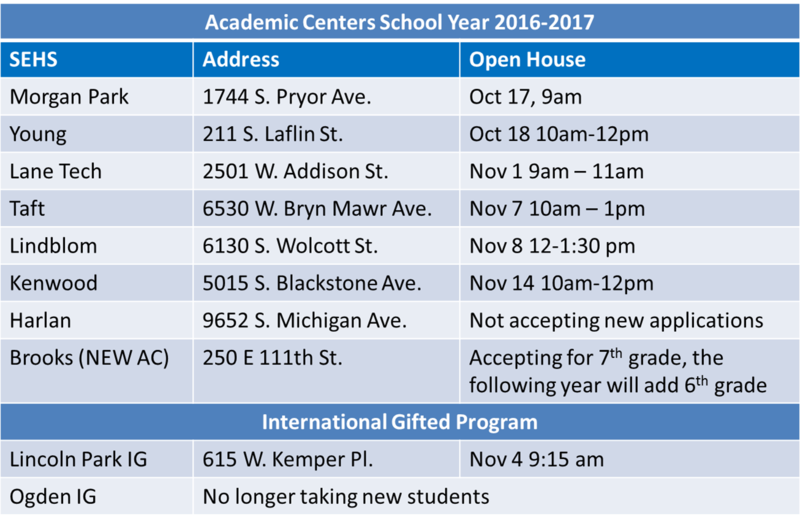 Gifted schools used to be “Regional Gifted Centers” -why did CPS change the name to to “International Gifted Program”? Any link to the IB curriculum? @1- Harlan is not accepting AC applications for the 2016-2017 year. Brooks is only accepting for 7th grade for 2016-2017. @4- Regional Gifted Centers are still around and are typically K-8 or 1st-8 programs. International Gifted Program is just middle school and only Lincoln has a program now. Check out http://www.ibo.org for info on International Baccalaureate. @3 I am not pantherettie but I do have an 8th grader at Lindblom (which I love). So far, there has been a seamless transition from Mr. Mather to Mr. Beavis (who has been the resident principal at Lindblom for 3 years I believe). The two assistant principals were not new to Lindlbom either. I think the administration did an excellent job of making the transition as smooth as possible. The kids miss Mr. Mather particularly for this upcoming Halloween since he won’t be outside on his unicycle in a clown’s costume throwing candy at them. I am glad they are moving AC from Harlen to Brooks because of the very low scores to be able to be part of a AC it was poor quality versus the others. All the AC should have a standardized education level. I hope lindbloom will continue and improve the only thing holding Lindbloom back is its location. The other problem with AC at harlen was that the children did stay or go to harden hs correct me if iam wrong. What happened to Dr. Alan Mather? I don’t remember seeing anything in the news or on this blog that he was leaving. Where did he go? As an FYI, at Lane, students can earn up to 10 high school credits. LTAC has an opportunity to take more high school level classes than Whitney and some other AC’s. Mr. Mather has moved on to share his talents and idea for a wider range of students. He is now the Chief of Office and College Career Success for Chicago Public. He is sure to bring creative and intuitive ideas for all students. @12, Students at Lindblom also have the opportunity to earn up to 10 high school credits. In fact, my daughter will have 10 credits when she graduates 8th grade this year. I will miss his post here, but I wish him well in his new job. He did great work at Lindblom and really worked hard to put that school on the map. When I was Googling his name to try to figure out where he went, I found this newspaper article from when he first started at Lindblom. They only had a dozen kids accept their seat in the first freshman class during the initial round of offers out of 124 offered. They really turned that around. So in regards to AC students having high school credit at the start of freshman year. Does the grades that they earned for that high school credit, count into their high school GPA? Yes, the credits count in their HS gpa. I know two parents who deeply regret their child’s choice to go an academic center for 7th grade (Lane). While they liked the AC, both kids wanted to go to a different SEHS school for 9th grade (Northside). But they were stuck. Because of the challenging AC material, their children got a “B” during 7th grade, while their former classmates at their previous schools were getting straight “A”s with easier material. There is no way to get into Northside with a “B” in 7th grade (tier 4). If your child goes to an AC, you need to be solidly certain that it’s the final high school choice. I just wanted to second that! I knew going in to the AC my kid would be stuck but I knew I could live with the HS. I know there’s been debate about this but I think SE elementary schools should get some bonus points similar to what they do on college apps. So that HS admissions are essentially determined by a test given to 4 year olds. That’s not making things better. Many colleges apply their own calculation of HS gpa, so while those grades may count for the “HS GPA”, it isn’t *necessarily* a number that matters beyond the walls of the HS. I disagree. The AC high school classes that these kids take in 7th and 8th grade are the same as the high school classes. Many of the kids are in classes with high schoolers. The only exception is if they transfer to a school that requires the child to re-take the class and then they don’t get the AC credit. Why would a college discount a hs biology class because it was taken in 7th grade as opposed to 10th grade? I think this is different from an inflated GPA because you attend a school that offers all honors classes. Hmmmm….. my kid was in a very rigorous school abroad for 7th grade. Would you have him getting “extra points” in his SEHS application? I certainly would not expect that. We went in knowing he had to meet the same requirements as everyone else. Everyone has to make choices for the quality of his own child’s education, not based on “where he will get in later.” Concentrate on finding the best fit for your child. If it’s an AC, great. If not, fine. @vb Agree that if you go the AC route, you want to make sure you want to attend that school for HS. If your ultimate goal is to leave, it is easier to stay at your elementary because as you said, you are risking getting a “B” because AC students take high school level classes, with high school teachers, with high school rigor and expectations. That said, there are so many AC kids who get all “A” and take HS admission test without any test prep, get into Northside or Payton or Jones, and end up turning them down to stay at the AC. The AC classes that earn HS credit are HS classes with all the HS rigor. They don’t cut AC kids any slack. I feel that in many ways, my kids skipped 2 years of school and dove right into high school at the AC, even though they went to RGCs. ACs are a different environment. Neither good nor bad, just different. It worked out well so far, no regrets, but I can understand why people (including me) say it is not for every kid. @25 Agree with your comment to Chris. At the WYAC Parent orientation this summer, we were told “Your children are starting High School in 7th grade”. Definitely not for every kid – mine is loving it so far, fortunately! With my younger one…not sure that would work out well. Also agree with other posters: My advice to friends with 6th graders is don’t bother with an AC if you don’t want to continue at that school for high school (unless you have to – Decatur, for example, ends at 6th so kids can’t stay). Look at what is best for your student. Just because that kid gets into an AC doesn’t mean you have to take it. Seriously. People may think you are crazy but it’s your kid. I couldn’t agree more with the posters above about AC’s. Even if you think you child will accel academically, don’t under estimate the social challenges of an AC. AC kids are treated like high schoolers and have more freedom and social opportunities than they ever have which also affects grades. My child was able to attendHomecoming, football games, and generally “hang out” afterschool in 7th grade. All of the freedom definitely took a toll on her grades last year. That being said, I think it was a great time to get that “out of the way”. She now realizes what it takes to balance academics with her social life. There is a night and day difference in her maturity this year from last. y’all can “disagree” however you like but it is a *fact* that some colleges recalculate HS gpas. It is also a *fact* that neither you nor I know exactly how a given college would treat a B in 7th grade in a HS class. It might be treated as a 3.0, or a 4.0, or something in between, or disregarded entirely. And *every* school might do it differently. The point of my noting that is that no one should be making the decision about AC or Not AC on the basis of what might happen to the kid’s HS GPA bc of 7th grade. Of course, if the end all be all goal is Payton/Northside, I entirely agree that most kids are going to be better served not going AC. I have an 8th grader at WYAC and agree with the comments below – WYAC makes it very difficult to apply to another HS, especially if your child tests into the most advanced algebra class for 7th grade, where it is much more difficult to get an A. My child got a high B first semester and an A second semester. Although her first and second semester numerical grades average to a 90 (A), her final grade is listed as a B, and that is what gets reported to CPS for HS application purposes. When I asked the counselor, I was told that the only way to get an A for a final grade is to have As in both semesters, even if the numerical grades’ mathematical average is an A. It is not fair to assign a B if the numerical grades average to an A, but there is no appeal process. Think carefully before sending your child to an AC if you aspire to Payton, Northside, or Jones. And if they go to an AC, think about whether they should be in the highest math class even if they qualify. I think the reason it was a “B” is because the cut off for getting at A at WY is 92, not 90 as most other schools. Whitney has always done it this way and they have a philosophical reason for doing so. True, it is probably not known exactly how it is treated by colleges. My point was that they ARE HS classes in every sense. I am going to look into it further as the LTAC AC kids are starting to graduate—-because some are graduating early with the credits built. However, I do think parents need to think about grades and college transcripts with choosing an AC because the HS class grades are on the college transcript. Correction: I think A cut off for Whittney is 95? Typo. I am sure someone will correct me if I am wrong. EG you are incorrect about the semester numerical averages. Patricia is correct about WY’s grading scale. Patricia I think WY slightly modified it and an A isn’t 95 but I know a 90 isn’t an A at WY. EG my son is in an AC in one class he had a high A for one semester and a high B the other semester. His selective enrollment paper has a grade of A. I am surprised WY’s counselor wouldn’t know the numerical averages are weighted. Chris–you are mistaken about the recalculation of GPAs. AC high school credits are counted. I have heard that colleges recalculate the GPA by taking out what they call fluff classes (i.e. gym, band, drama, ART 1 etc.) and that includes all HS students. The exception would be if you are majoring in Art then of course they will keep Art classes in your GPA, etc. I have read that some colleges even strip your language classes out of the GPA then recalculate the GPA. At Whitney Young, an A is 90-100. It is not 95. An A at WY is 93-100. I am a current WY parent too. Interesting that WY changed to 90 for an A. It was touted as a point of pride in the past that they push themselves harder. It makes sense that it should be consistent. Good to know. Thanks. And you know that each and every school does this? *Every* one? You cannot possibly know that. At the 10 or 20 colleges you are familiar with? Sure, I readily acknowledge that *many* schools will take the GPA for all ‘academic’ courses and tote it up, and for those that do, AC course count. And I *do* know of schools that toss out all sorts of courses in calculating GPA–not just fluff courses, not just HS courses taken in 7th grade (whether in AC or otherwise in a different district). I can say that AC credits are part of a student’s GPA and looked at for colleges. I have an LTAC AC student who is at Lane and graduating early (not the best choice for all kids, but we feel she is ready in lieu of the fact that she will turn 17 one month before she graduates high school) . She has been accepted into her college of choice but her grades from 8th grade DID affect her in a reduction of receiving some merit based scholarship money. This is a lot for a 7th or 8th grade student to understand. She has admitted to me that she did not comprehend the seriousness of her grades back in 8th grade and how it would hurt her later with college and scholarship money. Each college has their own requirements into looking at a student’s GPA and often the colleges are looking at their weighted GPA and not their unweighted. This is the case for our daughter and her college. She was evaluated on her grades and not the level of the course. Fair or not, this is the policy for her college. ACs are not for all but it is a great option if it is in fact what your child is craving. I think the ACs need to do a better job of talking to the 7/8th graders! Hearing it from parents might just go in one ear & out the other! LOL! Thank you KP for your comment. My child went through LTAC (now a sophomore) and I find your child’s college scholarship experience informative. With your child being in the first group of LTAC’ers to graduate, I think many of us with kids in younger grades are curious as to how it is going. @KP, I think the schools DO talk to the AC kids about the importance of grades already, but the whole middle school drama thing can get in the way and it’s really hard to gets kids that age to listen to anyone in authority. What I am reading here aligns with my disapproval of weight classes as well. This phenomenon started when I was in high school and I didn’t get it then either. If your kid is so gifted to place into a SE elementary school or AC, then they should be appropriately placed and their grade should reflect accordingly. The goal is to be in a rigorous environment for your child. If that is challenging for them it is a good thing – is it about the A or learning and being challenged? I was an honors student in high school and thought weighted grades were ridiculous. If I was supposed to be there, I shouldn’t receive “extra points” for it. It reflects the level I should be in. Yes, some colleges do, and some colleges won’t. Some colleges will give the 7th/8th ‘accelerated’ classes extra weight, many won’t. If you are making AC or Not decision because of the *possible* effect on college admissions/scholarships, without even knowing what colleges your kid will apply to, then imo you are focused on the wrong tree. Several years ago, CPS wanted a standard score for all the schools. I think Payton was giving 85% as A for some science and math classes. WY was 95% A. I think 4 years ago they WY changed to 93% A and CPS allowed it. But last year, CPS wanted a standard 90% A. Did I agree, not really, but I understand. #41~I think WY has done an excellent job in explaining to Ackies the importance of time management, their grades and how colleges look at those. #45~Chris~the grades from AC classes DO affect scholarship money. ALL HS classes (no matter what year taken) are considered by colleges. I don’t know any colleges that recalculate gpa except for classes that aren’t core. After talking with some universities where my son has been accepted and where my other son is going to apply, I believe this to be correct. That’s what I’m hearing from college admission counselors. We visited WY on Saturday for Open House and its our #1 choice. Planning to visit Lane Tech on Nov. 1st, but the commute is a concern for me. I was very surprised about the # of students who come to WY from as far as the Beverly neighborhood or far north by Rogers Park, near Evanston. I would think that makes for a long day. Leave home by 6:30 am for 8am school start time. Get out at 3:15pm or later depending on extra curricular and not get home until close to 6pm….then dinner, homework and do it all over again. That seems really taxing for a 12 year old. @47: I agree – it seems like it makes for a very long day, but I know there are plenty of people who do it. There are kindergartners travelling a long time on a bus each way as well to get to certain schools. Everyone has their priorities. Young is near my office so I sort of envision it as more doable since I go near there every day and could arrange to drive my son (I think) but otherwise I am not in favor of a super long commute, especially with winter being so grueling. From what I hear a lot of kids end up on public trans with other kids and it’s not actually that bad. The commute was a real concern for my child when we ranked our AC choices. (She is not a morning person) so we went with the program closest to home. We live in West Ridge, which is “far north by Rogers Park near Evanston” and Lane is a much better commute for her than WY would have been. If your child is an early riser, this may not be as big of an issue. I agree CPSO, everyone has different priorities and what works for one family may not for another. Thanks for the clarification. That makes total sense and as I read your post it rings a bell that I kind of remember the change…..but it didn’t stick since my sons have picked Lane over WY. Because Lane is so much closer and my oldest would sleep all day and stay up all night if he could. Also, can you explain how it “impacts scholarship money”? In a good or bad way? I am JUST starting to try and figure out the college stuff. I think it’s wonderful your child is getting a great education and he doesn’t have to commute. If we lived near Lane and my child attended there, it would have been a no brainer~stay at Lane. Ugh! The college process…glad I don’t have to do this for another year. When I wrote abt scholarship $$, I was talking abt merit scholarship from state and private universities, but not ivies (they don’t give merit scholarships~need based only). I realized that even a B impacts scholarship money. Anything that takes away from the best gpa possible, can impact the amount of $$ a student receives. I’m not say that a student would be denied admission, but depending on the number of Bs, wouldn’t get the same scholarship as someone who had a higher gpa. Although this was my first time with the college apps, I believe (although I don’t know for sure) that it may be that universities are putting more merit on the actual gpa (recalculated or not). Perhaps bc many are ACT optional. Although I asked many, many questions, no one wanted to actually talk abt equating grades with money, but you can see on their websites what certain gps/ACT scores are being given out. Also, if they want to apply for a scholarship from a department from their university, their gpa/rigorous class is weighed there as well. So if the gpa isn’t the best, they might miss out on a departmental scholarship. Apart from $$, I will add that ALL of them looked at the AC grades as HS grades and every1 of them awarded my son 30+ credit hours for his AP classes. I think as long as students get at least a 4 on all of their exams, they will get the credit. He could start many classes that were for sophomores. Just to touch on IB Diploma~I think top tier universities want students with those diplomas. Just my 2 pennies from being College Obsessed for the last 2years~I BELIEVE, WY prepared my child for college. He earned his spot there and he earned all those grades that allowed him to take advanced classes to be at his chosen university. I KNOW, it KILLS me that he’s far from home, I don’t want my next one to go that far, but whatever is best for the next one, is where my child will go. It’s hard letting go…. Thank you. Wow an A in AP Physics will convey more than rigor. He’ll probably have his choice of colleges. Congrats and good luck in the next obsession!! Thinking about the AC program at Whitney. Really want to end up at Payton for high school. I’ve heard Whitney makes it nearly impossible to leave. Anyone out there who was able to finish the AC and get into Payton, Jones or Northside? @55 – I was at the open house last week and Dr. Kenner said that last year six students left after 8th grade. It’s probably safe to assume they left for another SE school. It is difficult to leave for another high school from WYAC but I have known several kids through the years who have done it. Not only is it really hard to get all A’s in 7th grade, but there is so much school pride and most kids don’t want to leave. The situations I knew of were families who lived way north and they got into Northside which was a shorter commute. If Payton is your goal, you may want to hedge your bets and stay at your present school. There are no guarantees it will work out if you go to an AC, with the plan that to go elsewhere for high school. Those going to an AC should really be comfortable with the possibility of staying all the way through high school. @55 and @56 – Dr. Kenner was a bit off in her number. Ten students left after 8th grade last year – 5 to Northside, 4 to Payton and 1 to Jones. I believe that number was higher than usual, but don’t think it was due to issues at WY, but rather preferences based on things like specific extra-curriculars, block schedule and commute. More telling than the number that left is the number that had the grades/scores to leave but chose to stay. I agree that those going to WYAC should be comfortable with the possibility of staying, but even if your child doesn’t have the opportunity to make a switch, it is an awfully wonderful place to be “stuck”. Posting for a friend, hope it’s okay? Gail Reed (773-925-1035, gailreed@gmail.com) is a very experienced and excellent math tutor for elementary through college. She has a Masters in Pure Math and is consistently cheerful, encouraging, and clear in her explanations. She does math prep for the CPS selective h.s. exam, the ACT, SAT, GRE, and GMAT. She has helped my daughters for years, and they were glad she did. She is very accommodating and will come to you. Thanks. @55 – it is possible, but besides obvious things there is a question of transferability of credits. AC kids at WY get a lot of HS credits during their two years head start. Are you sure that Payton will let them come in with couple years of HS Math, one year of Honors English, Honors Biology? Many kids take band or dance that covers the CPS performance arts requirement. Some take honors drawing as well, that one covers visual arts requirement. Will they have to repeat all of that? At WY kids really have a 6 year plan vs regular 4 year HS experience which lets him get much more out of the program. I think this is the main reason why so few kids do leave. So take a look and check with Payton before you make the final decision. @55 – another thing to consider is the culture of the school. At Payton, an AC kid may have already taken English, but if they transfer in, Payton has them take Freshman English. Whitney and Lane and Kenwood are used to having AC students as Freshman in class with Juniors, but it is not the culture at Payton or Northside. Even if the student is able to handle the content, it is not as welcoming socially. I was told by a Payton teacher that AC kids have a hard time and in many cases to not speak up as the only Freshman in a class with with upper classmen. It is not that Payton kids are not nice, rather that the culture of the school is not used to AC kids. I am not sure what happens to the credits, but in many cases AC kids re-take classes they already took at the AC to get in line with other Freshman. Also, for example in the Lane AC, kids build 10 – 11 HS credits which affords great options in HS with electives, more AP, etc. Smaller schools like Northside and Payton, do not have as many electives as a Lane or Whitney. I know of a kid who transferred from Lane to Northside and in Jr/Sr years is having a hard time filling the schedule with meaningful classes. The student is happy at Northside, but has commented that opportunity wise, they would have had better choices if they stayed at Lane. In general, if you do not want to go to the AC for HS, it is best to hold off. As stated earlier, an AC is really a 6 year program and switching to a school with a 4 year program kind of gets rid of the benefits of the AC. That said, there are kids who do transfer and are fine. In the end, it depends on the individual kid. I know a few students who left WY for NSCP. I know one left for Payton. There were several who could have gone to NSCP, but chose not to. The kids who left for NSCP did so not bc they wanted to, but their parents wanted them to have a shorter day/commute. I really felt the others should have left so their day could have been shorter, but they refused. As a parent, I would have insisted, but as a student~I probably wouldn’t have wanted to leave. They are in a place where everyone is trying to do their best in their studies, they’ve made friends with ppl like them, and it’s a culture very dif from other SEHS. But in the end, the other kids made friends at their new schools, played sports, and are now enrolled in the colleges of their choice. However, they stayed very integrated with the WY students~going to many of their events. WY is a completely dif culture from other SEHS. When my son was in 7th grade, he took a computer class where you learned how the computer “talked”. It was him and one other 7th grader~the other students were all seniors. One day he came home and said that he had pizza for lunch. I thought~crap, he’ll probably get a suspension for leaving campus. WY has open campus for HS but not Ackies. He told me he didn’t leave campus, but that a kid in his computer class brought him back a slice when he went out. I was floored. When I was in HS I never would have even talked to a freshman and this senior was bring back lunch for a 7th grader. It’s just how it is there, it’s normal for kids of all class grades to be in school together and get along. Don’t be surprised if your child is accepted into WY and then doesn’t want to leave when it comes time for 9th grade. SSI4, I think Lane’s culture is becoming more like WY’s.The AC program is relatively new (the first AC class are now juniors) so younger kids mixed with older is still a little bit of a novelty. But many of the things you described are happening at Lane as well. My daughter is now a sophomore and has a mix of kids from all grades in her classes. Lane is very friendly and accepting place as well. I agree with WRP mom. My 7th grader is LOVING Lane. She has her elective with mostly high school kids and many of her friends have electives and languages with high schoolers as well. Seventh graders are in the highest level band and orchestra/ some are in higher level languages. Almost all of the clubs include AC kids. While she doesn’t consider any high schoolers as her ‘friends’ she says they are all nice, helpful and respectful. Lane just announced the cast for the musical and several AC kids were included, and not just in ensemble parts. We did attend the Northside open house. While my 7th grader liked it, she said she didn’t like it enough to leave Lane and ‘start all over’. Considering she’ll have to work a lot harder to get the A’s at Lane then if she stayed at her elem school its probably a nonissue anyway. Northside also has a separate Freshman English class for kids that come from AC and will already have an English credit. @64 Interesting that Northside has an English class for AC kids. I heard that Northside and Payton were trying to figure out ways to make switching from an AC more attractive (or less disruptive) because there are quite a few kids from ACs who test in and do not accept the spot. For my son’s class at Lane AC, I know of about 10 kids who turned down Northside and Payton. Can anyone confirm that applying to a gifted program at the same time as an AC does not jeopardize either? @ Delia. No it doesn’t jeopardize your application. On the application itself, there are different sections to choose from and their rank is in its own category. As a Northside mom who had an ackie at Taft, they leave with about 6 high school credits and my girl enjoyed her Literature class that was all AC students which she enjoyed very much. Hoping someone can help answer my question as it relates to the order of school preference. They both receive a score that would qualify for enrollment in Lane. I assume Kid#1 has a better chance of getting into Lane. Is there a big risk that Kid#2 would NOT also get into Lane? Ultimately what I’m asking for is a little more detail in how much the order of preference actually plays into the selection process. Can someone, who has been through the process, tell me what happens to the RGC applications once someone accepts an offer from an AC? Are you removed from the pool or do you still have a chance of getting an offer from a RGC in future rounds? After reading about the rigor at the ACs, I feel intimated and worry that if my child is not able to secure all As in his seventh grade, then his chances of getting into a SEHS would suffer greatly. But as I understand, the spots at RGCs open up much later than the offers from ACs have been made. Can someone please shed some light. @AC Info Are you aware you do not have to apply again for HS at the AC program that accepts your student? As long as you don’t want to change SEHS, you are set for HS! Preference comes into play when say, a child gets a score high enough for admission for WYAC, but ranked LTAC first. In that case, they would get an offer to Lane. We don’t know what this year’s cutoff scores will be so I would just rank your schools by which would be the best fit (child’s preference, geographic location etc) and see what happens. @69 ACInfo- you can get an offer from each application category you submit, so a 7th grade applicant can get an offer from an AC, an RGC/Classical, and the one IG school. The AC entrance test actually is one and the same as the RGC/IG test. It’s an aptitude test which does differ from the Classical school’s achievement test. If a student is applying to an AC, they might as well apply to an RGC and IG since that one entrance test covers them all. Accepting an offer at any of those categories does not take you out of the running for the others. A child can accept an AC and may later in the summer get an offer to an RGC. All ACs allow students to stay until 12th grade. Remember to finish both parts of your application by 5pm tomorrow (paper app) or by 11:59pm (online app). The deadline is firm and computer glitches (internet doesn’t connect, etc) can and do happen so don’t wait until the last minute! Thank you so much!!! Makes sense! We (my child) is going to IIT on this Saturday (1/23/16) for her test. We are applying to the AC @ Whitney Young for Fall 2016. What can we (me really) expect? Does anyone know if they send out the scores for the test before you receive the acceptance letter? No they don’t send out the scores early for elementary schools & that includes those who test for ACs. Perhaps and odd question: but what about sports? What are the opportunities for the 7th&8th graders for sports? Are there teams/leagues for them? Can they try out for the high school teams? Can the ride the bench on the high school teams? At LTAC there are sports. Basketball, lacrosse, cross country, flag football, etc. Compete in the CPS leagues with other elementary schools. They are not eligible for HS teams. Thanks for all the advice from current AC parents. It really helps! I know this was brought up long ago, but as far as weighting grades, I am in favor, if for no other reason than the current system encourages underachievement. For instance, we are at RGC’s right now. At least one of our schools has been known to move students from the RGC down a level in math, so they can get an “A”. Also, a friend of ours moved their child from a Classical School to a magnet (non SE) school, so the child could get A’s in 7th grade (the child had a couple B’s at the Classical school in 6th). While I understand the parents’ reasons for moving their child (I’d probably do the same), it all has to do with the way the system is set up. Should the goal really be to get an “A”? I kind of think not. I think CPS’s rubric should try to determine which students have the best chance of success in either AC or SE environments. That means taking into consideration both the grade and the level of the course. I’m not saying a “B” should necessarily be the equivalent of an “A” (which is a 25 point difference), BUT perhaps a slight weight of 5 extra points. At least you wouldn’t have people freaking out about one “B” and changing schools or moving down a level in a certain subject. Of course, this would add a level of complexity that CPS probably doesn’t have the capability to deal with, so I’m sure it will never happen. Does anyone know how the AC test is scored? On the Selective Prep website, it states that the highest possible percentile is 99.957% on the Academic Center Test. A student scoring “only” a 99.0% receives 255 points of the 300 points possible. I realize CPS does not endorse Selective Prep but so far I have found their info to be very accurate. Does anyone have any insight on the scoring? They say there is long tail to the bell curve on this test. How many questions are kids getting right to score at 99.0% plus? Maybe there is no way to tell but just thought I would see if anyone has insight? 3d paragraph from the bottom. @80 one way to do that would be to make the AC test “knowledge based” (like the SEHS test) vs “aptitude” as it is now. @81 I couldn’t figure out the scoring last year. My daughter said she didn’t even answer 6 questions yet ended up with a score high enough to get her a spot at WY (tier 4.) The number of questions don’t match up with the points. Also, March 25th is a system-wide furlough day now. Will they send out letters on the 24th? Or make everyone wait? Has anyone gotten their acceptance letter? @86 No one has. They won’t be mailed until March 28th. anyone know the cutoff scores? They probably won’t be posted until after the letters have been mailed. Does anyone know if they plan on mailing them out on Friday the 25th (original date) or the Monday after? I called the other day and they said they were sending out the letters on March 28th. From reading past year blogs, it seems like they sometimes send them out earlier than the stated date. Thank you so much, @90. Guess we all have to wait very patiently right? Does anyone know how many people will be accepted to the Whitney Young AC? I hate this long wait for the SEES letters! Does anyone know of any openings in NTA’s 1st grade program? @93 Are you talking about next year’s 1st grade class? If so, there are 27 kids in the K RGC class at NTA, so my guess is that there will be at least one spot avail in next year’s 1st grade class. In practice, probably one or two more, although those might not be available until later in the spring/summer. Yes, I am wondering about next year’s class. They cap at 28? I thought most SEES classes could accept up to 30. The classical schools cap at 30, and the Regional Gifted Centers cap at 28 (for K; not sure about upper grades). They add four (making 32) in 3d (? or is it 4th??). I am currently a 6th grader at a classical school. I have learned many things there. Even if I don’t make it to the AC I want to go to, my school is still a good choice for me. If anyone does noit make it in, I strongly recommend that you try for a classical school. Is everyone expecting the letters in the mailboxes on 3/28 or in reality is it going to be 3/30? So anxiously awaiting the letter! Daughter really wants Lane but she could walk to Taft. I guess it will be a win either way but I’m starting to panic. She had straight A’s and 99 and 91 percentile on MAP. She took the selective prep class but in looking at last year’s Lane cut scores, it seems like that won’t be good enough. Am I doing the math wrong on this? I guess I’ll find out soon enough but each day I get more and more worried…. Letters will be mailed on March 28th so don’t expect it until Wednesday. My daughter is so nervous! She has straight A’s and a 98 and 99 in MAP. She’s hoping to get accepted to Whitney Young but we’re afraid it might not be enough. I wish they would have given the us the test scores already. We would know what to expect. My daughter is also very Nervous! My daughter got a 99 percentile in math and a 98 percentile in Reading. She got all A’s in every subject. I really hope that she can make it. WE are all so nervous. I forgot to mention, We are hoping for our child to get into Whitney Young AC. Good Luck to all those students eagerly waiting for their mail! Does AC have principal discretion? No, I’m pretty sure they don’t. Anyways, What tiers are you guys all in? We are also waiting on pins and needles for AC results. My kid is hoping for LTAC. All A’s, 99/99 and tier 3, but no idea on this test! These last two weeks can’t go fast enough…. We are tier 4. My daughter had 99 percentile on BOTH reading and math in the winter last year but she had a “bad” day on the spring math test day and got 91st. I knew that the 91 eliminated WY as a possibility but It’s so crazy to think that might be the thing that makes Lane out of reach. Crossing my fingers that she knocked the entrance exam out of the park. Good luck to everyone! @99 Fbbelle. I am no math expert, but I think your Tier 4 daughter still has a good chance at Lane or WY with a 587.9 going into the entrance exam (300 in grades and 287.9 in NWEA scores). If last year’s cutoff numbers hold reasonably steady (and no one knows right now, except CPS), she would need to get a 856 to get into LTAC and a 868 to get into WYAC. That means she would have to score at least a 269/300 to get into Lane and a 280/300 to get into WY. LOTS of kids who are good at tests score that high. I know at least two kids who scored perfect 300s on the entrance exam after taking Selective Prep and one who got a perfect 300 just walking in with no prep. Keep the faith, everyone! @106, good luck to your daughter! The stress can be overwhelming. The letters should be coming in about a 12 days! I pretty sure the homework for AC is very hard. If your child makes it in, You should prepare them for what’s coming. By the way, Does anyone know the cutoff scores? Here’s the thing: Selective Prep sez on their website that you have to get a 99.617 percentile score to get 269, and 99.832 percentile to get 280. And *that* causes a dose of anxiety that may not be accurate. / Because they gave me a sheet saying, 99 Percentile. Don’t believe so–I think that the Selective Prep score conversion assumes a parallel bt the AC Test and a fully normed, SD-15 IQ test that may not be as tight as implied. But, if your kid get a 290+ on the AC test, you can tell people she scored in the 99.9+ percentile, based on their chart. Thank you! I was wondering what test they compared it to as the entrance exam for an academic center is not a widely given test (to my knowledge). On the phone, they told me that they don’t disclose the percentiles that the kids get because there it “is a bell curve with a very long tail”. The sheet that the person got referring to 99% may have been relating to scores on the NWEA. My kids school sent home a sheet with the scores of 99/94. Glad to hear we are still in the running for WY Tier 4 provided that the entrance exam was a strong score. Thanks for the reassurances and the information about the scoring. She did really well on the practice tests for selective prep (well above the class average that they posted) but still not even close to perfect. We are keeping our fingers crossed. My daughter won’t even talk about it! How many more days until the letter comes? I mean, Its already March 17. 138/150= 99.435% = 264/300 rubric score. I (also) don’t believe that the AC test is *actually* on a SD-15 curve. I don’t believe that the AC test scores (on the 150 point scale) correspond to IQ scores (almost everyone will say they are not *representative* of IQ, which is a different question) that directly. But that is what Selective Prep is showing. They are providing (possibly misleading) information that is not otherwise available. And that “information” pumps up the anxiety level for anyone looking at it. I’m. So.nervous!!! The letters could be coming out soon! My son got all as but got a 97percentile one reading. Reading has been his least favorite subject. We are shooting for Lane AC. I hope he can make it. He’s smart, but he’s not motivated. At his school, they learn above grade level, but her is not challenged enought. Any suggestions?? They’re going to get mailed a week from Monday. There is really no chance of it being earlier than that. My son and I are really nervous. I mean, The letters are coming out soon. This pressure has affected my son. All of his life, he’s been a good student, But I mean, Last year, He kept striving for number 1. He did every extra credit opportunity and usually gets the top grades. I try to persuade him to take a break, But I mean, he keeps on going. I’m proud of him, But I think he needs a break. Any advice? When will the letters come out again??? Letters will be mailed out next Monday. Good luck to all!! I for one, can’t wait until this is over. Good thing I only have one child. Lol. Just wanted to add my two cents for all of you who are waiting for AC acceptance letters. My daughter had all As and 99th percentiles in reading and math going into the AC test but had a bad test day and did not get accepted to her first choice WY. She did get a seat at Taft, but decided to stay at her elementary school. She was heartbroken initially (as we were for her) but was able to stay with her friends at her school and has really enjoyed 7th and 8th grade. She got all As and 99th percentiles on her MAPs last year and ended up with a 900 composite going into her SEHS application, so had her choice of schools. She ranked WY #1 and is thrilled that she will be a dolphin next year. The point that I am trying to make is that there are silver linings beyond the heartbreak for those of you who may not get a seat this go around. I wish you all the best, but please know that getting an AC seat does not necessarily define your future trajectory. Thank you for those words! Well put! I’ve heard from others that the first people to get their letters will be the ones who make it in. Is that true? My friend daughter said that last year, she got hers early in March. @126 two years ago, it *seemed* like acceptances we mailed first because the initial posts on CpSO were positive. Last year, it did not appear to be that way. Either way, CPS says they don’t do that. The acceptance letter from OAE stating my child was accepted to their #1 choice arrived in our mailbox a full week after they were sent out. In fact, we received an email from the AC school counselor before the letter ever arrived. And yes, it was stressful. But during the extra wait, and watching friends from school handle the results from their letters, my child worked so through many emotions that I realized everything would be ok either way. Just a heads up, at schools where a large number of students are going for these spots, it can get a little intense. Easier said than done, but try to be positive about your child’s results and their classmates results, regardless of tiers and scores. Does anyone know the link to the cps obsessed classical/gifted 2016 thread? The one I was following hasn’t had a post since January so I am guessing there is a more current thread. I just can’t seem to find it. Thanks! 5 MORE DAYS TILL THE LETTERS SHOULD BE COMING OUT! There are only a handful of ACs. If your child does not get into one of them now, do not give up hope on a great SE high school in a couple years. In fact, you have reason to have LOTS of hope, lots more than you think! Your child gets the opportunity to stay at their current school, enjoy their friends and teachers a little longer, perhaps score better grades and standardized test scores than they would have at a new, higher-pressure AC school. They can have the pick of the litter of ALL of the SE high schools, including those they do not have a feeder AC. Make sure you tell your child about this extra “edge” they get–after they process the results of this tough process, they may see the opportunities it presents, too. With this extra time, go to all of the SEHS open houses you can, try to find the right fit for your particular child. You’ve been given the gift of more time to get to know your still-developing child and where they would be most happy and successful. Think about test prep for HS–might be worth it to know that you left no stone unturned. Straight As are hard to come by for most kids in the ACs. So much change, such high expectations and challenging material! Most of my kid’s friends at LTAC have already received a B or a C. If they wanted to leave (which most of them do NOT) they would find it tough to do so, due to first semester grades. They are essentially locked in for 6 years. I have zero regrets about LTAC–my kid LOVES it and we have been very impressed with the teachers and staff and the opportunities to grow independence (under watchful eyes). The commute is easy. My kid wants to stay there and not test for other SEHS…but we’ll see. Remember, your kid is awesome just the way they are and they have YOU, a caring and concerned (ok, call it “obsessed”) parent in their corner, so they will do very well no matter where they land for school. Best of luck everyone! @133 You are so right, LTAC Mom. My son worked really hard and did not get into the WYAC in the 7th grade. He was really sad and worried back then. Flash forward 2 years, and he’s just been accepted to Walter Payton – which honestly is a better fit for him, especially the small size. Good luck to everyone and remember that all of this works out in the end. The kids end up happy with their schools and figure it all out. Although a bit premature, I recognize, I’m wondering if anyone happens to know when the orientations tend to be for WYAC and LTAC? Beginning to think through possible summer plans/camps/trips and wondering how an acceptance could shape those months? Actually I mean during the summer, when the new kids start group bonding over activities? The letters are coming out monday……………………………………….. I just want to wish everyone luck. I was in your position two years ago. My son really wanted to get into the LTAC, but he didn’t get in. He cried when the letter came, and this is a kid who rarely cries. I felt so bad for him. Two years have passed since then, and he was accepted into Northside. So don’t despair if your child doesn’t get in to an AC. Wait the letters are coming out on Monday, Not today. Right? Yeah, The letters should come out Monday. I wish everyone good luck! It’s not easy to get into an Academic center. Hi everyone! We’ve been feeling a little nervous regarding the decisions. Wish we could make the time pass sooner. My daughter is interested in math, science, and computer programming. The AC’s seem to provide an excellent opportunity for her to develop these interests. She really wants to join a great math team. At the same time, and no matter what happens next week, we continue to remind her that the AC’s are only one path of many to advance her goals. Best wishes to everyone!! The experience of this process will be helpful if my daughter needs to apply again for SEHS.